Download Dell Wireless 1397 WLAN Mini-card Driver For Windows Vista. The Dell Wireless 1397 WLAN Mini-Card has a network rate (for data) of up to 54mbps and has unscheduled automatic power save delivery (UAPSD) support. It works with a Wi-Fi certified wireless router (one of any type) or wireless client network adapter.It has the ability to connect to any wireless router regardless of the make and model, as long as the firmware and client software are always updated. 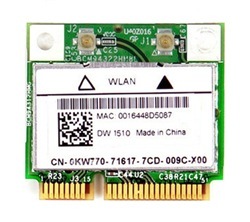 The Dell Wireless WLAN Card allows you to connect to any Wireless Area Network (WLAN). Dell Wireless WLAN 397/1510 Half MiniCard Driver and is supported on the Inspiron, XPS Notebook, Vostro, Precision and Latitude models that are running the following Windows Operating System: Vista.